At Skids Wairakei we provide fun and safe activities for children aged 5-13 years based out of Wairakei School Hall. 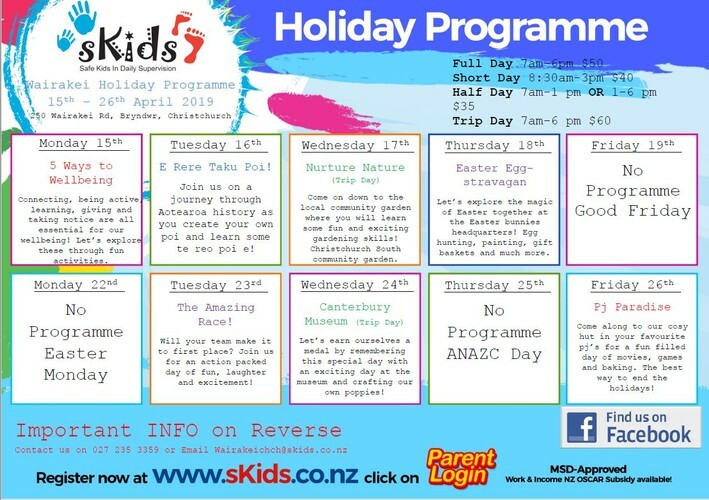 We provide a variety of activities throughout the day both on site at Wairakei School and out and about in Christchurch. Skids will be open from 7am-6pm with a roll call at 9am. We have session times to suit all situations. Please take note of trip days and what time we will be leaving school. Please make sure that you sign your child/ren in and out of the programme on the programme tablet every day.